Summary: Brickhouse Environmental developed a secondary containment system design for loading and unloading liquid chemicals from tanker trucks at this facility. We also prepared several design alternatives and cost estimates and worked with the client in selecting an alternative that met the requirements for secondary containment, was not burdensome on operations, simple to construct, and cost-effective. 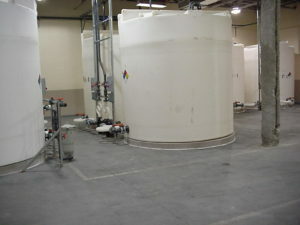 The secondary containment system comprised three containment areas, each consisting of concrete containment and an outlet structure providing sufficient containment for chemical transfer operations. We also prepared plans and specifications for bidding of the project.